Album: Are We Not Men? We Are Diva! 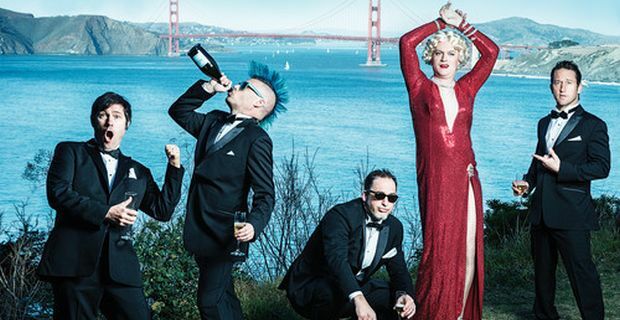 There are very few acts in the world that featured as predominantly in the highlights of my social life during my teenage years as Me First and the Gimme Gimmes. So it’s with this nostalgia-tinged bias firmly etched in the pleasure seeking portion of my mind that I set about pressing play on MFAGG’s new album, the excellently titled Are We Not Men? We Are Diva!. A punk-rock tribute to 12 of the world’s most infamous divas’ signature tunes, Are We Not Men? We Are Diva! features MFAGG providing their own take on classic songs by the likes of Christina Aguilera, Whitney Houston, Gloria Gaynor and Cher (among others), and the results, I’m relieved to say, are nothing short of triumphant. Indeed, from the moment the familiar intro of Gloria Gaynor’s “I Will Survive” makes way for an explosive 2:27 of the classic ’90s skate-punk we have come to know and love from these guys, We Are Diva! proves to be an absolute riot of a time. What happens in the 30 minutes provided here is anything but original and all the more enjoyable for it. Personally, I couldn’t help but find myself dancing like the whitest boy alive while singing along at the top of my voice to MFAGG’s stellar renditions of Paula Abdul’s “Straight Up,” Lady Gaga’s “Speechless” and Culture Club’s “Karma Chameleon” and if you are a fan of MFAGG and their trademark shtick, you will no doubt find yourself doing the same. While admittedly venturing into some rather well-worn territory with their song selections (how many times have we heard a punk act cover “Crazy For You” now, seriously) MFAGG manage to add enough of their own flavour to each track to keep the record flowing nicely. Highlighted by the stupendously hyperactive cover of Christina Aguilera’s mega-anthem “Beautiful” (complete with Fat Mike’s unmistakable punk-rock snarl killing it on the backing vocals) and the bluegrass-tinged folk-punk of Celine Dion’s hilariously over-the-top “My Heart Will Go On” (Slawson, take a bow) We Are Diva! is a rambunctious return to form for MFAGG that proves that there is life left in this gimmick yet. Undoubtedly the best sounding record of MFAGG’S career production wise, Are We Not Men? We Are Diva! does exactly what it promises on the cover and provides a damn fun time while doing it, and considering having fun is this act’s modus operandi, what more could or should you ask for? You can listen to the band’s cover of Paula Abdul’s “Straight Up” below.